Myotein promises to aid in faster muscle recovery and production, as well as promote the breakdown of fat tissue, giving you leaner, stronger muscles. Looking for an effective source of protein beyond what you put on your dinner plate? That’s what Myotein manufacturers say that have created with their protein supplement.Looking for an effective source of protein beyond what you put on your dinner plate? That’s what Myotein manufacturers say that have created with their protein supplement. Myotein uses six sources of protein to trigger muscle protein synthesis and prevent existing muscle structure from being broken down. With a high bioavailability, it is also advertised to work faster than other protein supplements on the market. To see if Myotein actually stands up to existing research, however, we decided to conduct a review. Here, you’ll find ingredient analysis, purchasing information, and how Myotein stacks up to the competition in terms of protein delivery. Myotein is more than just a protein powder. In addition to supplying 6 protein types, it provides multiple ingredients to boost energy levels, accelerate fat loss, and speed muscle recovery. Whey Protein Isolate. Whey protein isolate stabilizes blood sugar, promotes fat loss, and builds muscle. It maximizes protein synthesis and recovery time and has a higher biological value than any protein form. It has the highest protein concentration (90-95%) and contains very little (if any) fat, lactose, and minerals when compared to other whey protein forms. Whey protein concentrate contains branched chain amino acids (BCAAs) that provide the basic building blocks for muscle growth. Protein concentrations range between 25-89%, though most whey protein products offer 80% protein. Hydrolyzed whey takes protein isolates filtration processes one step further. Through technological means, whey isolate proteins are split into smaller amino acid chains. This mimics our own digestive system’s effects, and in a way, the protein is “pre-digested.” Hydrolyzed protein is absorbed more rapidly than non-hydrolyzed proteins. Casein protein takes longer to digest than whey protein, ensuring steady amino acid release. Micellar Casein’s effects last exponentially longer and it is critical for muscle recovery. Glutamine acts as a buffer against muscle catabolism, or muscle breakdown. It protects against cellular acidity from intense physical training and decreases ammonia build-up in the blood. Colostrum is the first milk secreted during pregnancy and is rich in antibodies that boost immunity. It is higher in protein and lower in fat than milk. It prevents sickness and fatigue during training and aids in recovery. Cocoa: In addition to providing natural flavour, cocoa contains high concentrations of amino acids, antioxidants, and nutritional minerals such as magnesium. Alkaloids found in cocoa may increase energy and improve mood. Honey: Naturally sweet, honey contains chemicals which kill bacteria and fungus. Furthermore, it is rich in vitamins, minerals, and antioxidants. Guar Gum: Guar gum is a high soluble fibre often used as a thickener. It may lower cholesterol. Lecithin: A fat essential to the body, lecithin is converted into acetylcholine which transmits nerve impulses. Lecithin doubles as a food additive, keeping ingredients from separating. Sunflower Creamer: Sunflower is a great source for unsaturated fats but has little effect on physical performance. Sodium Chloride: More commonly known as salt, sodium chloride maintains fluid homeostasis during exercise. Aminogen: Created by Triarco Industries, Aminogen is a unique compound that increases nitrogen retention. It aids in protein breakdown and enhances amino acid absorption. Lactase: This digestive enzyme is essential for digesting whole milk and its various proteins (whey and casein). Sucralose: Sucralose is an artificial sweetener. Most sucralose is not broken down by the body, so it is non-caloric. Acesulfame K: A calorie-free sugar substitute, Acesulfame K or Ace K is 150-200 times sweeter than sugar. Mucuna Pruriens: A precursor to dopamine, epinephrine, and norpinepherine, Mucuana pruriens stimulates the pituitary gland to optimize hormone levels. It also stimulates muscle growth and fat burn. 20 Hydroxyecdysterone: This hormone is said to boost athletic performance, increase lean muscle mass, and enhance nitrogen retention. However, additional research is needed to confirm these effects. Coleus Forskohlii: This unique herb increases energy levels without acting extensively on the central nervous system. It stimulates ATP production and raises metabolism. The makers of Myotein, XPI, have designed Myotein with six different types of protein so that your body has enough variety to produce healthy muscle tissue. Myotein also contains special amino acids, like the patented enzyme Aminogen, that help your body absorb such a high volume of protein. And to make sure that your muscles are as lean and as toned as possible, Myotein also includes ingredients that promote lipolysis, or the breakdown of fat. Coleus Forskohlii, one of the main ingredients in Myotein, has been shown to help your body rely on fat stores for energy rather than burn muscle tissue. Most importantly, Myotein has 26 grams of high-quality protein to make sure that you have plenty of protein to fuel harder, more intense workouts. These sources of protein include three different types of whey protein: Whey Protein Isolate, Whey Protein Hydrolysate and Whey Protein Concentrate. These all include branched chain amino acids that act as the building blocks of healthy tissue. As well as deliver your body essential nutrients for proper muscle function. Myotein also has a large dose of Micellar Casein that is a slow-digesting protein. This protein forms a gelatinous substance in the stomach that can keep you feeling full and satisfied for hours. Micellar Casein can be especially beneficial if you are using Myotein as a meal-replacement drink. Does Myotein Have Side Effects? Although Myotein does have ingredients that are tough fat burners like 20-Hydroxycdysterone that make sure your metabolism is burning in its highest gear, Myotein doesn’t have any ingredients that would be dangerous. Some Myotein users did mention that they felt slightly jittery when they took Myotein, an effect of metabolic boosters, but this can be rectified by taking Myotein with a small bit of food, or even mixing it with milk. How Is Myotein’s Customer Service? Many people who have used Myotein before have commented on its exceptional customer service; mentioning that their inquiries were promptly answered and problems attended to. Not only does Myotein come with a full money back guarantee, should you be dissatisfied with Myotein, but its company also offers a live online chat service as well as a hotline you can call. How Do I Order Myotein? Is It Easy? Myotein.com is the best place to order Myotein. The official distributers can give you the safety of a 90-day money-back guarantee, as well as the reassurance that your order will ship within a day and be delivered as quickly as the next day if you choose the FedEx Standard Overnight option. How Do I Best Take Myotein? Once you’ve got your order, you need to know how to use it in order to see the best results. We recommend taking Myotein right before bed, when you wake up, and even before your workout, in addition to taking it afterwards. This will help prime you for your workout in addition to helping recovery and growth afterwards. Customers have said that Myotein tastes best when mixed with milk. You can decide your fat content on your own, but 2 percent milk usually results in the thickest shake. It’s also possible to take with water, but it doesn’t quite taste as pleasant. When you’re taking Myotein, we recommend that you work out at least four times a week—the same as we would recommend for any protein supplement. Considering the solidity of the ingredients and the freedom with which you can take Myotein, we think that it is frankly one of the best muscle building supplements out there. It contains all the right forms of protein, as well as ingredients designed to cut back on fat, and is easy to use and backed by a solid company. Even if you don’t like Myotein, you have the comfort of knowing that you can return the product within 90 days. For all of these reasons, we recommend you give Myotein a try. Why So Many Types of Protein? Many bodybuilders already know that protein is essential for building muscle and improving performance. However, they often stick to just one protein form (such as whey protein or whey casein), with a single absorption rate. Nevertheless, multiple protein sources offer varying absorption rates, so you can have the amino acids your muscles need when you need it the most. The fast-absorption whey protein gives your muscles a quick boost, while the slow-digesting casein offers long-term results. Myotein does not contain dangerous stimulants or steroids, so you don’t have to worry about the usual side effects commonly associated with muscle-building supplements. 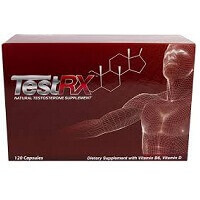 Most consumers experience great results with no side effects when they use Myotein correctly. However, incorrect Myotein dosages and taking Myotein alongside other medications increase your risk for experiencing negative side effects. To ensure safety, consult your doctor before taking Myotein. Although Myotein creates the ideal environment for muscle growth, it cannot build rock hard abs or chiselled arms on its own. As with any supplement, Myotein works best when combined with a healthy diet and regular exercise. 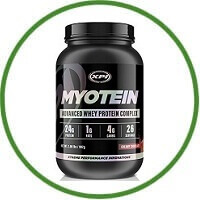 Each Myotein serving (2 scoops) offers 26 grams of protein. You can take more or less depending on your current protein needs. It can be mixed with water, juice, or milk. If you’re looking for a low-calorie supplement, then water and ice is the best choice. If you’re looking to bulk up, then milk provides a smooth and creamy texture. Myotein is available in chocolate and vanilla flavours. According to James Jarrett at Amazon.com, “XPI Myotein (again, orange bottle) tastes outstanding, mixes VERY easily and does not give the bloating sensation of other powders. This is a top notch product and you will not be disappointed whatsoever. It only comes in chocolate (that I am aware of) and tastes to me just like chocolate milk, even though you mix it with water. I prefer to order from XPISupplements.com because you can get a great deal on Myotein and it comes with a 100% money-back guarantee if you don’t like the results. Although XPI Supplements is a small company, it’s quickly gaining many avid consumers and die-hard fans. The company offers a wide array of muscle building and performance enhancing supplements, including Myonox, Myoswell, Xtreme ZMA, and Syntheroid. According to the Better Business Bureau, no complaints have been filed in the last three years. The only factor that lowered XPI’s rating is the length of time the company has been operating – which will change. Myotein is great tool for improving any workout. The protein is high-quality and the additional ingredients improve results and flavour. It easily competes with lead brand names and products, and I’m particularly impressed with the money-back guarantee provided by the manufacturers. I think Myotein is worth trying. If it doesn’t work for you, you can always return it for a full refund.